At the heart of my exhortations that Buddhists should ignore the Pew Forum’s U.S. 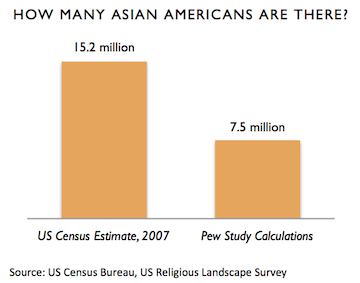 Religious Landscape Survey is that the study tragically misrepresents Asian America. Past critiques, such as those cited by Rev. Danny Fisher, focus on the Pew study’s methodological problems of potentially undercounting immigrants or omitting the state of Hawai‘i. Fair points, but the impact of these methodological errors is hard to gauge. In other words, we can rail against the study’s methodological flaws until we’re red in the face, but in order to demonstrate (rather than speculate) that the outcome of the study is flawed, we have to look at the numbers. I’ve done this before, but given James Coleman’s ingenuous reading of the study, I feel obliged to do so again. This exercise uses the estimated population of the United States during the year the Pew study was conducted—301.6 million (courtesy of the U.S. Census Bureau)—in addition to three statistics from the Pew Study: 0.7% of Americans identify as Buddhist, 32% of American Buddhists identify as Asian, and 9% of Asian Americans identify as Buddhist. Apply the first percentage to the total American population in 2007, and you end up with some 2.1 million Buddhists in America. Now if 32% of those American Buddhists are Asian, then there are a mere 676,000 Asian American Buddhists. The Pew study tells us that 9% percent of Asian Americans identify as Buddhist, and since we know the Pew estimates there are about 676,000 Asian American Buddhists, we can combine these two statistics to reveal the size of Asian America in the eyes of the Pew study. It’s simple algebra: if 9% of x equals 676,000 then you just need to divide 676,000 by 9% in order to find x (i.e. the number of Asian Americans). This yields 7.5 million Asian Americans, or about 2.5% of the American population. But wait a moment! The U.S. Census estimates there were 15.2 million Asian Americans in that year. That’s more than twice the estimate we came to from the Pew study’s numbers. Slice the numbers another way, and you arrive at the same dilemma. When Coleman writes about a very white liberal middle-class face of Buddhism, he bases his entire understanding on a set of numbers that are irredeemably skewed against Asian Americans. Take the Pew study’s Buddhism statistics at face value, as James Coleman does, and you partake in the racial marginalization of Asians in Western Buddhism. I just can’t say it enough. Stop using the Pew study!